The BRC accreditation body advise all customers who wish to validate a suppliers credentials to log onto the following website www.brcdirectory.co.uk as copy certificates ( whilst available for downloading ( opposite) from Cumberland packaging ) can be easily manipulated. BRC: GLOBAL STANDARD FOR PACKAGING AND PACKAGING MATERIALS - ISSUE 5 JULY 2015. 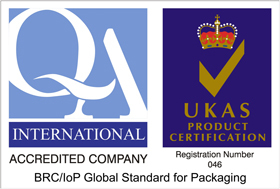 Cumberland Packaging was successfully accredited with BRC CAT 2 in January 2010. Cumberland use Fiberboard corrugated products manufactured utilizing recycled and recyclable material which are intended for use as secondary packaging only and not for use as direct contact with food products and will meet all relevant legal requirements, such as the packaging( essential requirements) regulations 2015. These products have therefore been classed as Low Risk in line with Issue 5 of the BRC Global Standard for Packaging & Packaging Material. This also relates to any post-consumer recycled materials.